In the Gospel of John it is recorded that Jesus healed a man who had been blind from birth at the pool of Siloam. "Now the rest of the acts of Hezekiah; all his might, and how he made a pool and a tunnel and brought water into the city; are they not written in the book of the chronicles of the kings of Judah?" "The account of the breakthrough is as follows: While the tunnelers were working with their picks, each toward the other, and while there was still five feet of rock to go through, the rock split to the south and to the north, and the voices of each were heard calling one to another. And at that moment, the laborers broke through striking pick against pick. Then the water flowed from the spring to the pool for a distance of 1,900 feet. And the height of the tunnel above the heads of the laborers was 160 feet." And He said to him, "Go, wash in the pool of Siloam." So he went and washed, and came back seeing. He said, "He is a prophet." 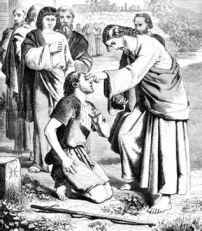 But the Jews did not believe concerning him, that he had been blind and received his sight, until they called the parents of him who had received his sight. And they asked them, saying, "Is this your son, who you say was born blind? How then does he now see?" He answered and said, "Whether He is a sinner or not I do not know. But one thing I do know: that once I was blind, but now I see." Then they reviled him and said, "You are His disciple, but we are Moses' disciples. "We know that God spoke to Moses; as for this fellow, we do not know where He is from." The man answered and said to them, "Why, this is a marvelous thing, that you do not know where He is from; yet He has opened my eyes! "Now we know that God does not hear sinners; but if anyone is a worshiper of God and does His will, He hears him. "Since the world began it has been unheard of that anyone opened the eyes of one who was born blind. "If this Man were not from God, He could do nothing."